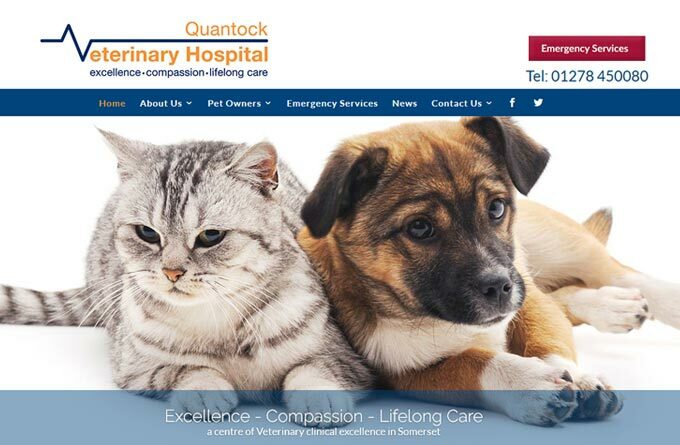 The Quantock Veterinary Hospital is based in Bridgwater, Somerset, and offers outstanding standards of general practice care for all small animals – dogs and cats, rabbits and other small mammals, reptiles and domestic birds – 24 hours a day, seven days a week. We have top quality diagnostic and treatment facilities for general care, more complex cases and emergencies have ensured our RCVS ‘Small Animal Veterinary Hospital’ accreditation – the very highest standard achievable. Our reliable, highly trained and caring team provides a full range of preventative healthcare, medical, surgical and emergency services. From puppy classes, to travel clinics, from laser therapy to keyhole surgery, our friendly team at the Hospital go out of their way to help our pet patients and their owners through all veterinary matters and a lifetime of care.